I hope your Christmas/New Year holiday season has been a good one. This Sunday, January 5, we resume our normal schedule at FCCC and we are kicking off 2014 in such an encouraging way. 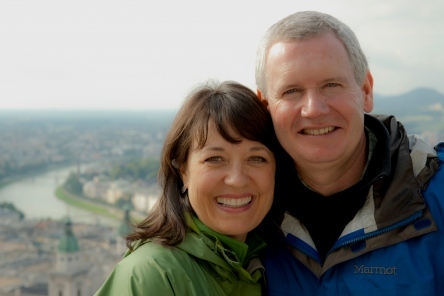 Mac and Mary Owen will be with us this Sunday. Mac will speak in both worship services and both of them will speak to a combined adult class during the Sunday School hour. We will have Bible Classes this Sunday for children through high school but all adults will meet together in the Worship Center to hear Mac and Mary during Sunday School. Who are Mac and Mary Owen? Here’s their story: Mary and Mac Owen are leaders in Celebrate Recovery and have been working together in recovery for over 25 years. They have shared their testimony 120 times in the past 4 years to over 48,000 people (in churches, Celebrate Recovery seminars, rehabs, prisons, and festivals). Mary Owen was born and raised in Monroe, Louisiana. Mary’s father, the late Alton Howard, was an entrepreneur who founded Howard Bros. Jewelers, Howard Bros. Discount Stores, and Howard Publishing Co. In 2006, they sold Howard Publishing to Simon & Schuster. Mac Owen was a military child who moved to Monroe, Louisiana during high school. He opened M&M Millworks (cabinet shop) in 1984 and has been growing the business ever since. In 1991, both Mac & Mary attended seminary for two years & graduated from White’s Ferry Road School of Biblical Studies. Mac was ordained as an elder and pastor at White’s Ferry Road Church of Christ in 1995. Mac & Mary have been married since 1976 and have three children and eight grandchildren. In 2012 they decided to sell their house in West Monroe and have it turned into a recovery house for addicts. They now live in Colorado near two of their children. Mac and Mary’s story will be a powerfully encouraging one, full of the kind of hope that only our great God can produce. Do you know someone who needs a fresh dose of Christ-centered hope? If so, I urge you to pointedly invite them to be here this Sunday.